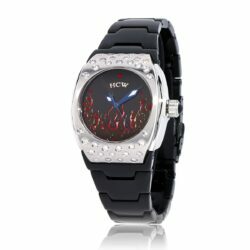 Stainless Steel case and bracelet, Japan automatic movement, in gift box, boasting a two-tone polished and matte IP black finish with 1.25 cts of Black Diamonds. 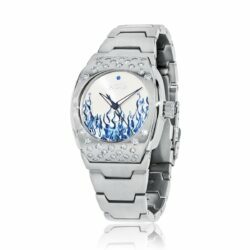 Flaming Heat is crafted in 316L stainless steel. 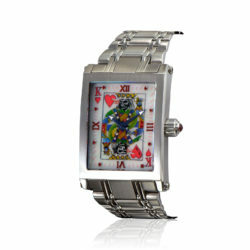 It boasts a two tone polished and matte IP black finish with 1.25 cts of Black Diamonds. 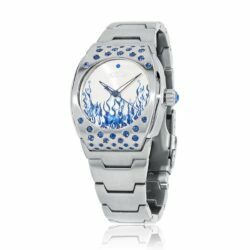 Its flames are sculpted in 3 dimensional casting on a sunray dial and accented with fire red Swarovski crystals individually set above the flames. Each link is machined to perfection and contours to your wrist. Flaming Heat is designed with a stunning exhibition case back.